Elin av Skövde lived in Västergötland during the 1100s, towards the end of the period in which Christianity became established in Sweden. She became a nationally-famous saint. Elin av Skövde was born to noble parents in the early 1100s. Little is known of her parents or when they lived. When Elin av Skövde came of age she married and had several children, including at least one daughter. However, Elin av Skövde was widowed at an early age and never subsequently remarried. As a widow she managed her own financial affairs, which included making donations to the Christian church. During her lifetime Elin av Skövde was noted for her tenacious adherence to what were then relatively new Christian customs such as fasting, praying for others, and doing worthy, Christian deeds. Elin av Skövde contributed to the establishment of a church in Skövde as well as another church in Götene, later. After being widowed she was able to and had the means to undertake a pilgrimage to Jerusalem. She went on this journey after her son-in-law had been murdered by his servants. According to accounts his servants were angry because their master had assaulted his wife. Elin av Skövde was accused of intentionally causing her son-in-law’s death because she wanted to protect her daughter. It was also claimed that Elin av Skövde had had a dream that she would die in Götene but be buried in the new church which she had financed in Skövde. This did come to pass. Shortly after her return from Jerusalem, whilst walking between her house and the place where a new church in Götene would be established, Elin av Skövde was murdered by her son-in-law’s relatives in revenge for his death. It was not long before miraculous events began to be reported in conjunction with the care of her remains, and this led to her being venerated locally as a holy woman and a saint. 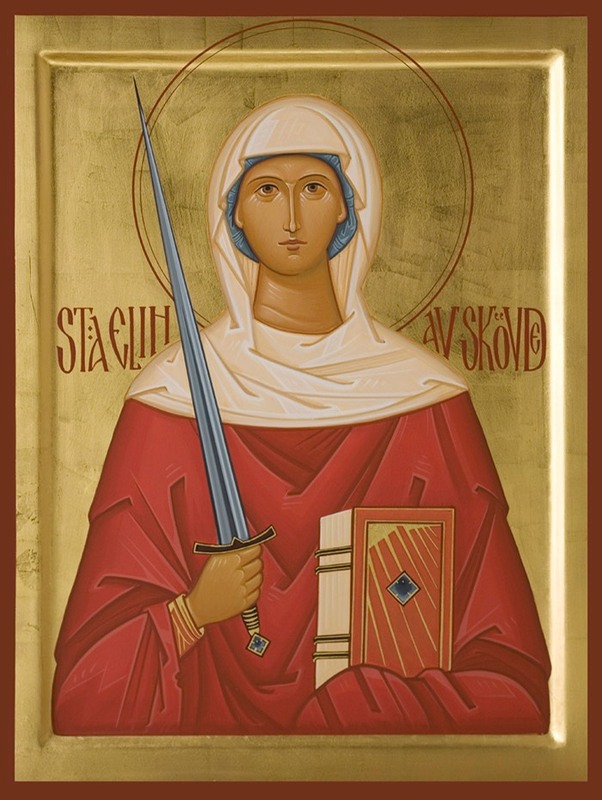 Elin av Skövde became famous and revered as a saint throughout Sweden before the end of the 1300s. Her feast day was celebrated on 30 July in Skara diocese and on 31 July elsewhere. Skövde municipality honours Elin av Skövde in their municipal coat of arms. Elin af Skövde , www.skbl.se/sv/artikel/ElinafSkovde, Svenskt kvinnobiografiskt lexikon (article by Sara Ellis Nilsson), retrieved 2019-04-22.